Have you ever gotten so tired of looking at something in your house, you had to do something about it? More recently it was the pillows on our couch for me. I just needed a change. At first I thought that buying new pillow covers were going to be a easy fix. Even at the big-box stores, it will cost about the same for new pillow (with a cover) as for just a new cover. Then there's Ikea... unfortunately, Ikea didn't have any that fit our pillow sizes. As a rational person, I could not justify buying brand new pillows because I was didn't like my old ones anymore. That's when my creative brains starts churning... I'll just make my own. After browsing through fabric stores, I came to the conclusion there wouldn't be much of a cost savings for the materials and my time, only because the quality of the material I'm looking for is on the higher end. Back to the drawing board. While walking past a clearance section at Target, I noticed a significant amount of shower curtains on sale for 50%-70% off. I did a quick calculation and realized I can make 4 pillow covers for about $10 (that's $2.50 each). Not only do I love the color and design, one of the edges will already be finished which means less work for me. I didn't do a tutorial since there are tons out there and it would probably take me longer to document it compared to actually making them. Instead, I've put together a short list of tips on how to make them. Make them fold over. Those are probably the least work. 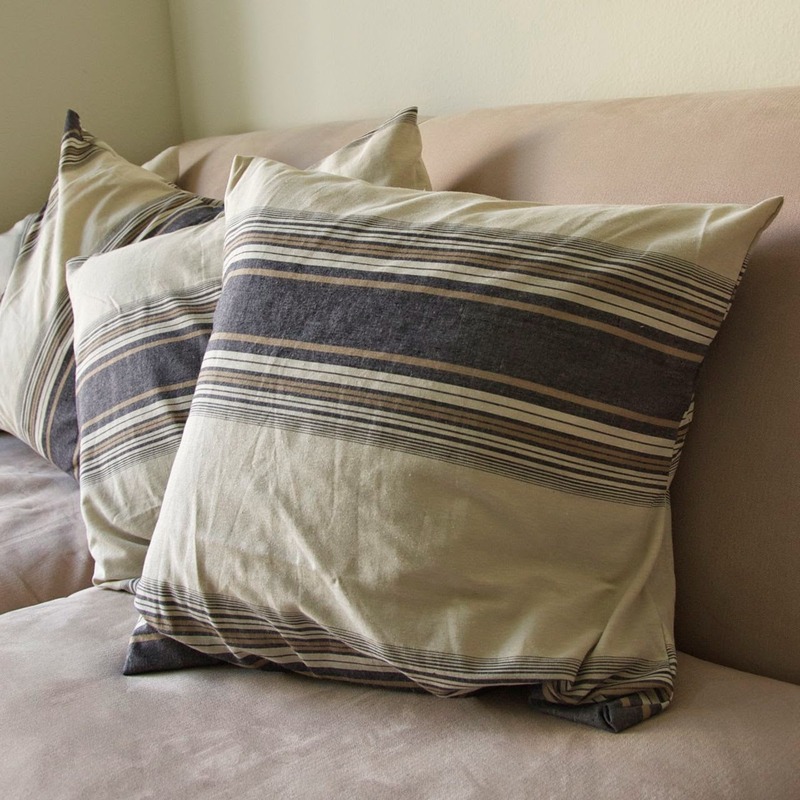 Here's a great tutorial for a fold over pillow cover. Use a patter with straight lines, like stripes, plaid, checkers, you get the idea. It makes for cutting and lining up edges very easy. If you can get it at a discount, use a shower curtain, table cloth, or sheets, etc. You'll already have one finished edge to work with, which means less work. Also the material is usually thicker, which is what you would like for a pillow cover. 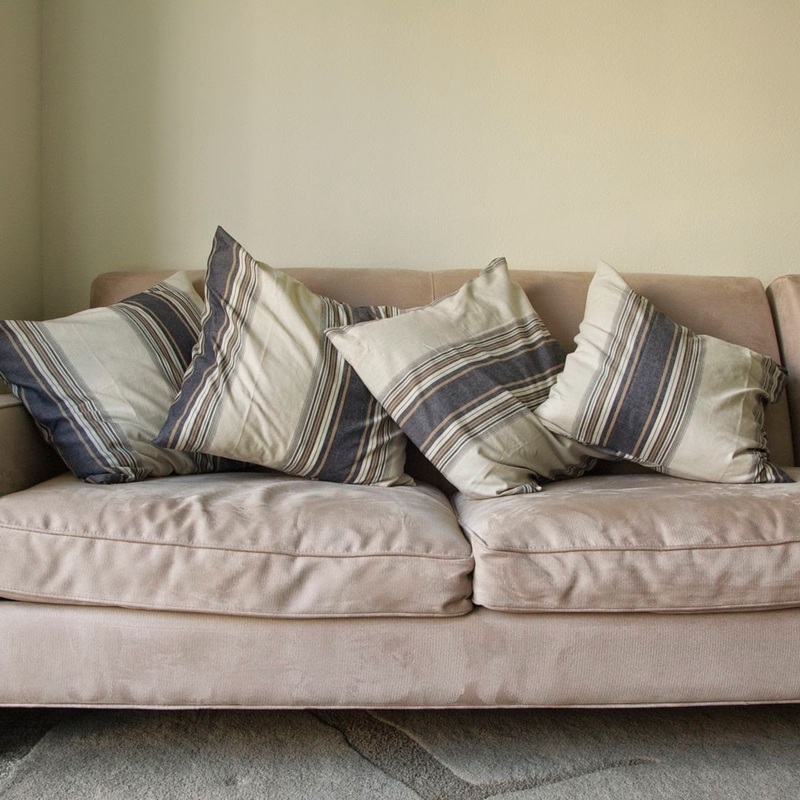 If you already have existing pillows, measure the edges and add 1" to all the sides than mirror it. That's the fabric you'll need to work with. I guess that's it from me. Let me know if you have any tips of your own.